DOORBELL’S JUST GOT SMARTER – No more peeking through the peephole or opening the door to see who’s there. Now you can view on the large 4.3” LED touch screen to see who’s at the door, with peace of mind. RECHARGEABLE BATTERY – No need for complicated wiring. The rechargeable battery lasts up to 2 months. TWO-WAY AUDIO – Talk to your family, friends or even scare away intruders with Two-Way Audio. You’ll be able to speak to others and hear what’s going on without having to be there. MOTION DETECTION & ALERTS – Can’t watch the camera 24/7? No problem! With motion detection, the camera will immediately track what is going on and alerts will notify you. 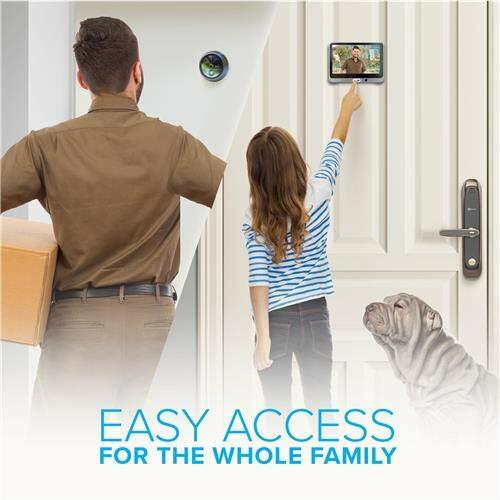 BUILT-IN SMART DOORBELL – The smart door viewer comes with a doorbell and sends notification to your phone and the LED touchscreen whenever someone rings the doorbell.